There's a picture of an animal's life that's just about standard, and even favored by many animal advocates: an animal's life is all choppy. Your dog lives moment to moment, without the moments being connected together into "wholes." By contrast, there is lots of connection in the life of a human being. This diffierence (people assume) has relevance to the value of animal lives, the badness of animal deaths, and the ethics of killing. To wit: this sort of contrast is made especially starkly in Jeff McMahan's book The Ethics of Killing. He has a rich notion of the "wholes" that matter in the lives of people. For one, there's the whole formed when you anticipate a later time and wish it to be a certain way--you want to lie on the beach in Hawaii in three months. All signs are that animals don't have thoughts like that. But that's not the only sort of continuity that counts. As an animal continues to live, goods may continue to accumulate in sequence, but the effect is merely additive. There is no scope for tragedy--for hopes passing unrealized, projects unwillingly aborted, mistakes or misunderstandings left uncorrected, or apologies left unmade. But surely the lives of animals are full of premature endings. 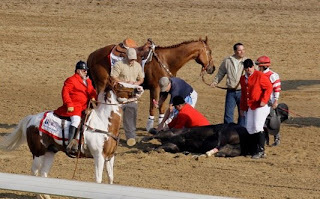 For example, a year ago Eight Belles collapsed moments after coming in second at the Kentucky Derby, because of two broken ankles. That broke off a story before it was over. Are we really to think that a horse that races madly to a finish line is not engaged in a "project," that no project has been "aborted" if the horse falls to the ground? I have the feeling we spend too much time around denatured pets and farm animals to realize that animal lives don't just consist of a series of moments. Beavers work for months to build dams. Rutting season doesn't end as it's supposed to if the animals are shot by hunters before there's any mating. Emperor penguins spend weeks trudging back from the sea to feed their young--an effort that ends badly if the chicks have died in the meantime. I know what some people are going to say. The animals don't think about the future--Eight Belles wasn't looking forward to her victory lap; the deer aren't thinking about copulating; the penguins don't desire a reunion with their young. But narrative unity is supposed to be a further factor affecting the significance of a death, one that goes beyond the issue whether death prevents desires from being fulfilled. In the human case, it does not seem true that an incomplete project is only tragic to the extent that the agent had a particular set of desires and thoughts. All that adds to the tragedy, but isn't all there is to it. Thinking of an animal's life as a series of discrete moments makes its death matter less, and so makes it easier for us to kill with a clear conscience. We need to think about the lives of animals without so much eagerness to find the sharpest possible differences. You know Jean, I was thinking about this kind of stuff specificaly when you first introduced McMahan on TP, in connection with Buddhism. Becasue Buddhism specifically states that the coherence of the self is an illusion, and that the connection from moment to moment is part of the web of Maya and not something to get particularly excited about. The fact that this would appear to undermine many human projects is what gets Buddhism a bad name...i.e. gets it called a religion of nihilism. And while this kind of attitude really can be connected to a kind of "it's OK to kill people because they will be reincarnated as part of a series of disconnected moments" (see the Bhagavadgita) it also can produce a kind of ethtics that is rooted in behavior that is sourced in people who are less likely to kill in the name of this or that project. Isn't this what we admire in animals when we (on some occasions) hold up their natural "wisdom?" That in all their disconnected moment to moment lives they move naturally with the rythym of some unseen pattern without the need to assert their own project over and against all the rest of existence? Faust, I'm torn between two ways of reacting to this stuff. On the one hand, I'm not sure about all these tight connections giving extra value to a life, or increasing an individual's interest in going on living. On the other hand, it seems possible to exaggerate the choppiness of an animal's life. They do have some of these connections, if you're not overly narrow and anthropocentric about what counts as a connection. It just seems stupid to think that a bird flying for months to the north pole has no project, and merely lives from moment to moment. If you don't count that as a project, just because the bird isn't full of hopes and dreams on the way, then you've got a very narrow, biased standard. By the way--I just put this at the new and improved TP too. But it's nice to have some comments here. Well let me offer a personal story that may help with the issues you are torn over. When we think of things McMahan's way, we split the world so: on the one hand increasingly complex webs of memory and intention that allow us to develop and pursue projects in the world, and on the other hand essentially empty "instants" devoid of all content, meaning, and coherence. The former is more valuable than the latter, and humans have more of the former than the latter. On the Buddhist view McMahan is quite right about the coherence bit, but completely wrong about the empty instants parts. I have had some experience with serious meditating and the purpose in simple vipassana meditation to develop a particular kind of mindfulness. Without going into needless detail, my experiences (and I am not a rigorous practitioner so I don't want to oversell this) has been that there is definitely a state of consciousness that one can achieve that is "in the now" that is very very far from being empty in the way that McMahan seems to imagine it. It is very very very difficult to describe. There is a reason that mystic traditions trade in on the word "ineffable." People scoff at this term, but to me this is just profound ignorance writ large. It would be like a blind person scoffing at someone struggling to explain the color red to them. Now to be clear, I make no claims as to what such ineffable experiences MEAN inside of discourse. But they do give one an experience of consciousness that is entirely different from the coherent-over-time-narrative that we tend to associate with our "valuable" lives. I do speculate that animals have experiences that partake in some way of the kind of "immediate" consciousness that humans can experience through meditative techniques. How this fits into their sense of themselves flying in migration, (or swimming in migration in the case of whales) or any grander pronouncments I wouldn't be willing particularly to venture. But I'm quite confident that there is a kind of value in the immediacy of experience that one can experience in meditation that is at least equal to the experiences that derive from complex and coherent projects. I do think the McMahan ideas seem very close to how we think about these things in general: based on what you've shared he seems to have articulated some of our intutions very well. That doesn't mean however, that our intuitions about the value of our narratives are quite right, even after being well articulated.